Each time we’ve come down to Blois since we signed the final papers in April, most of our waking hours have been spent getting the gîte ready and planting potatoes in the rain. So this time, we decided we’d have a holiday. 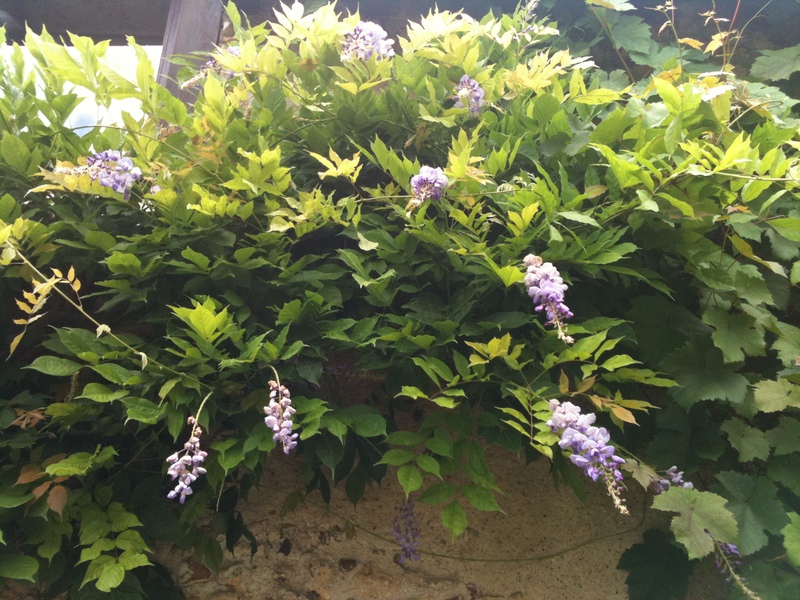 Yesterday was our first “work-free” day so after a côte de bœuf cooked on the barbecue in the garden, admiring our reflowering wisteria, we cleared the table and set off for a walk in the twilight. These are the longest days in the year when it doesn’t get completely dark until 11 pm! 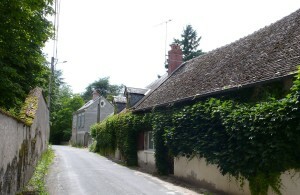 As we were walking up our road on the way back from a long ramble at about 10.30, we saw two couples about our age in front of a house whose ivy-covered front façade gives directly onto the road and could hear them laughing and saying, “Shh, not so loud. Don’t be so noisy” – in French of course. So as we got closer, I said, “Who are these people making so much noise in our street?”. Everyone laughed and I introduced us as their new neighbours. Relationnel chipped in, describing the house. “Oh, yes, then you must be the Australian!” came the reply! Once again, my fame had gone before me. Mr Previous Owner had obviously been paving the way for us. We chatted and joked for a few minutes, then Françoise suggested we all come inside for a digestif, explaining that they had been celebrating her husband’s birthday. We accepted with alacrity. Françoise and Paul arrived in Blois 24 years ago from the Paris area and found intergration into the local community difficult at first. 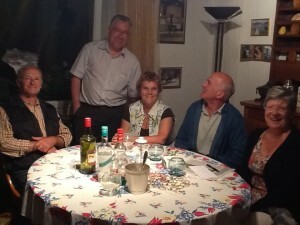 Since Françoise has a degree in English and Paul works for an American company, they have hosted many English speakers over the years, mainly youngsters, but Françoise told us a very funny story about a 74-year old American who came to stay and was surprised at the lack of air-conditioning. She even wanted to change host families but in the end, Françoise was able to get her into the local bridge club and, from then on, things improved considerably. Their neighbours from just a couple of doors down, Liliane and Alain, are real locals. Well, not quite. Lilian is, as she, her parents and grandparents were born in Les Grouets, which is the name of our neighbourhood. She knows all the local history and was able to fill us in on the area. I had noticed Alain’s accent but didn’t like to ask where he was from. Not that he would have minded. He’s a great wit and obviously the life and soul of any party. It turns out he’s Solognot from the region called La Sologne, between the Loire and Cher rivers and only a stone’s throw from here. It’s known for its forests and lakes and was a favourite hunting ground of kings and princes. Its most famous châteaux are Chambord and Cheverny. You may remember that we went to a huge brocante at Chambord in May. We learnt from Paul, who’s in IT, that we’ll be getting a fibre connection in 2014, which is wonderful news. Françoise brought out her iPad (oh, wasn’t I jealous!) and took photos so I told them about the blog and the Loire Connexion community for anglophones masterminded by Summer Jauneaud. Françoise was delighted because she doesn’t have a lot of opportunities these days to speak English. The time slipped by incredibly quickly, no doubt helped along by some sort of mint on the rocks digestif and we didn’t leave until well after midnight! What a wonderful start to our holiday ! And very encouraging for our future life at Closerie Falaiseau. 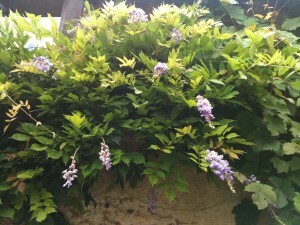 This entry was posted in France, Lifestyle, Loire Valley and tagged Chambord, cheverny, côte de boeuf, Les Grouets, Loire Valley, wisteria. Bookmark the permalink. What a lovely time it sounds like you all had. We certainly did and last night, Liliane and Alain came over with a cadastral map from the last century.